Before you start and publish your next WordPress blog post, make sure you do some prep work. This will save you time and effort when you log into your dashboard to add a new post. 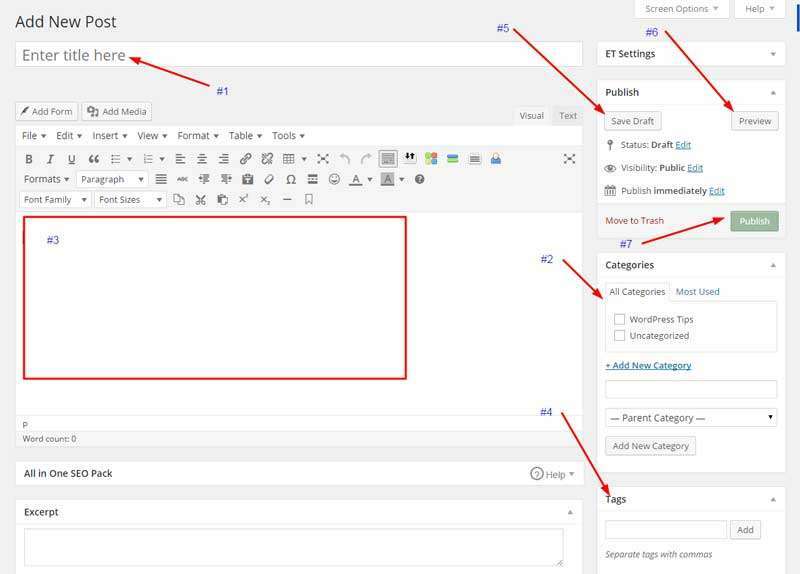 Follow these basic steps when using the WordPress editor during your blog creation. See the featured image for guidance on each step. Keep the title short as possible. If possible use “Researched” Keywords or Keyword Phrases. Note: Do not change the title after you have published your post. If you do, just know that it will no longer match the URL that was generated for your post when it was first published. This could cause 404 errors (page not found) with the search engines. If you feel a post could fall under more than one category, pick the most suited category. Then you can further define your content by adding Tags. Note: You have the ability to create categories on-the-fly from within your post editor by clicking on the link titled “+ Add New Category”. Some themes require you to update the blog page when a new category is added. The blog page may be configured to only show specific categories. Be sure your new category shows on the blog page. It’s recommended that you type out your content for your blog post in a plain text editor. Most computers come with a plain text editor like Notepad(PC) or TextEdit (Mac). Make sure you have completed all your edits. Once you are satisfied, copy and paste from your text editor into your blog post editor. Now you can begin to use the post editor to set Headings, Bold text, create bulleted or numbered lists, etc. Note: If you are using Word as your editor you may see undesired results after you paste your content. This is because during the copy, hidden control characters or formatting are not translated very well into the native language used by web browsers. If this happens, try pasting the content from Word into one of the editors mentioned above, Then copy from the text editor and paste into the blog editor. A Tag’s job is to further describe what the post is about. This post’s tags are “creating a post” and “WordPress Editor”. My category is a more general term, “WordPress Tips”. The Tags give more detail than the category can give. Note: You can have 10 tags if you want. Just make sure what ever you use, it is relevant to the content of your post. The more you have been blogging you can reuse tags. Click the link labeled “Choose from the most used tags” to quickly get to tags you have been using for other posts. WordPress does have an Autosave feature that gets triggered on a regular interval. But don’t rely on this. If you are about to pick up a phone call or step away from your computer, click the Save Draft button first. One day these words may become very clear for you when you least expect it. The Post editor does not always show how the post will look when it’s published on your website. That’s why it’s a good idea to do a Preview before you Publish your post. This is especially true if you are doing any fancy formatting of your content. Now that you have done all of the steps above and you are satisfied with everything, there is only one thing left to do for your basic post. Take the time to select a Category and a couple of Tags for each post. These simple steps will go a long way with the search engines. Your readers will also appreciate that your blog is organized, which makes it easier for them to find the content they want. And finally make sure you preview your post to make sure it looks the way you intended it. Do you want to make your own Videos just like you saw in this Blog Post?